All should work. You will need to re-add the leash and or dog toy via console or by crafting. Double Pet Bug should be totally fixed. Added ability to Call Dogmeat from anywhere anytime, even while you have another companion using the dog leash. 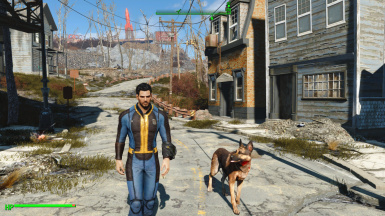 You can now whistle for Dogmeat to follow you from anywhere in the wasteland. 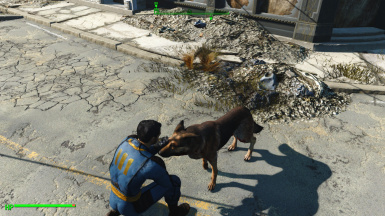 If Dogmeat is already your companion you will order him around instead. Re-wrote Scripts for further optimization. Removed Pet option from dialogue. 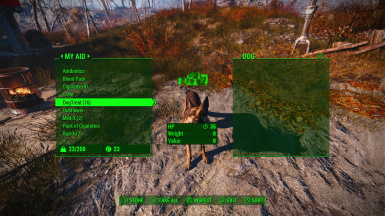 Vanilla Dogmeat quest now untouched, no vanilla records altered mod should be compatible with everything now. 2. 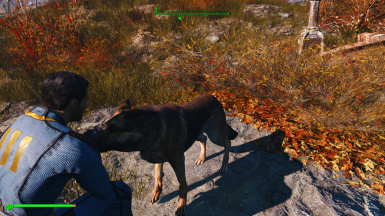 Feeding Dogmeat Treats - Works exactly like Dogmeats TeddyBear. Walk up to him and select the option to trade with him. Give him a dog treat, he will come up and take the treat from your hand. The mod comes with custom sound effects of a real dog eating :). 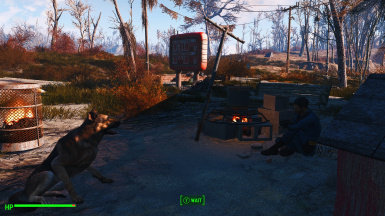 The treats you give him will disappear from his inventory right away, you can't give a dog a delicious treat and expect it to stick around ;) Treats will give Dogmeat +1 strength and +1 agility for 120 seconds, plus restore a bit of health. 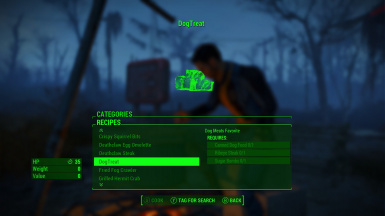 Treats are craft-able at the cooking station for 1 Brahmin steak, 1 box of sugar bombs and 1 can of dog food. Each recipe gives you 12 dog treats. The player can also eat the treats, but it won't give you the same buffs. It will reduce hunger in survival mode and add a bit of health though. 4. New Dog toys - Red Rocket Squeaky toy. Give dog meat his fav red rocket squeaky toy. He will play with it. Any standard vanilla Red Rocket toy in the game world should work. FadingSignal -He's one of my fav modders, this mod is heavily inspired by his work. Hopefully I am not stepping on his toes with this. I borrowed a bunch of ideas from him here and re-created them with my own twist. Dexesttp/hkxpack -Thank you for this awesome tool!